The Collie first appeared along the border areas of Northern England and Scotland and is thought to have been introduced by the Roman invaders many years ago. The origin of the name ‘Collie’ is said to be derived from the word ‘coally’, as earlier Collies were predominantly black and white. Another theory suggests they were named after the black-faced 'Collie' sheep that were guarded by these loyal dogs. 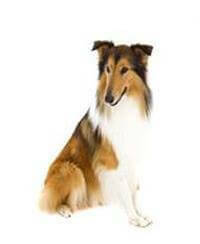 There are two types of Collies; the Rough Collie and the Smooth Collie – each named after their style of coat.